Liverpool piled the pressure on defending champions Manchester City as they extended their lead over their Premier League title rivals with a comfortable 4-0 victory over Newcastle. While Pep Guardiola's side were slipping to third place after a second-successive surprise defeat - this time at Leicester - the Reds barely got out of second gear in dispatching the struggling visitors. Dejan Lovren's brilliant 11th-minute half-volley set the tone and after a soft penalty given for a foul on Mohamed Salah enabled the Egypt international to score his 15th of the season, Xherdan Shaqiri and Fabinho completed the rout. City, whom Liverpool face at the Etihad Stadium on January 3, are now seven points off the pace with Tottenham now the nearest challengers at six behind. Newcastle had won just twice in the league at Anfield in their history, with the last success coming in 1994, and former Liverpool manager Rafael Benitez's decision to rest leading scorer Salomon Rondon did not say much for their ambitions in ending that run. Goals are a premium commodity for the Magpies on this ground - where they famously had two thrilling 4-3 defeats in the mid-1990s - with just five in their previous 11 visits. That meant taking their chances was pivotal and there was none better than the first of the match which fell to Joselu when Matt Ritchie's hanging cross dropped over Virgil Van Dijk at the far post but the Spaniard planted his downward header wide. It was the last sight the visitors had of goal until the 54th minute when Joselu flicked wide another header after Andrew Robertson lost possession on the edge of his own penalty area. Liverpool gradually moved through the gears while never really exerting themselves at their maximum. However, they did not need to be anywhere near their best, especially when the combination of a poor Jamaal Lascelles' header and a striker's finish from Lovren produced the opening goal. Shaqiri took a corner so quickly neither Lovren nor his centre-back partner Van Dijk were in position for it, but it worked to their benefit as Robertson's cross - via Lascelles' head - dropped at the Croatian's feet and he smashed in a half-volley which was still rising as it hit the roof of the net. 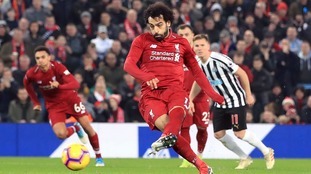 What followed was a loose, scrappy game in which Liverpool could not properly get a grip while Newcastle did just enough to suggest a threat without ever turning it into a realistic challenge. Firmino's clever dink over the top forced goalkeeper Martin Dubravka to rush to get there just ahead of Sadio Mane while Shaqiri's swerving, deflected free-kick was tipped over by the goalkeeper at the end of the half. Three minutes after the break Paul Dummett tangled with Salah and although the contact did not appear enough when the Egypt international hit the floor, referee Graham Scott pointed to the spot. The Reds' top scorer confidently converted Liverpool's first penalty at Anfield in 424 days for his sixth goal in the last five matches. Ten minutes from time Shaqiri side-footed home from Trent Alexander-Arnold's cross before substitute Fabinho bundled home a corner as the hosts kept their 12th clean sheet of the campaign - the same number they achieved when they last won the title in 1989-90. A bonus by-product was it allowed Liverpool to match City's goal difference, which had been 14 in their rivals' favour at the start of the month. Regardless of whether that is relevant or not in the long run, Liverpool will arrive at the Etihad next week top of the table.